The Spring of 2016 here in Montana started off a little further ahead than many years that I have hunted here in the past. Snow lines had already made their way halfway up the slope of the Bridger Mountains right outside of my hometown of Bozeman which meant I was going to have to hunt in the higher elevations earlier than normal. 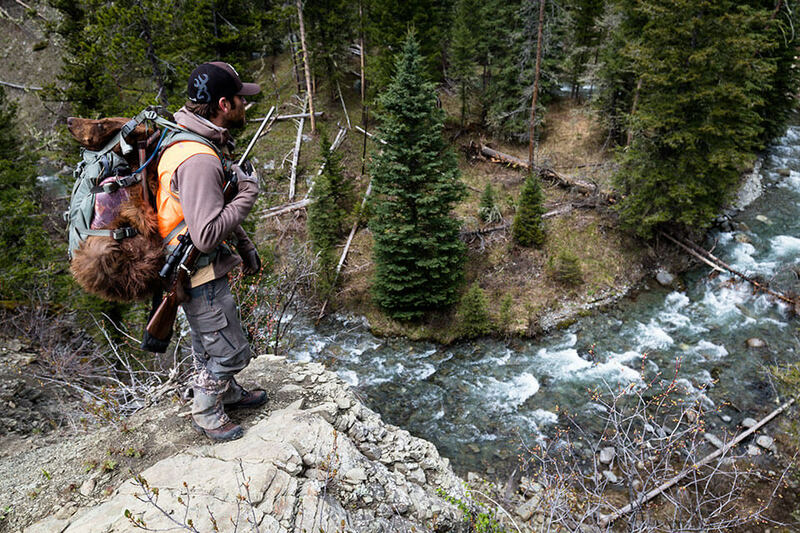 When hunting bears in the spring, I often hunt along the snow lines because it offers the bears the best of both worlds. Open hillsides filled with fresh chutes of green grass and water, yet a cool, damp place to spend during the heat of the day. My plan was to concentrate my efforts to the first month of the season, mainly, because I prefer to hunt bears early when their available food sources are so few and far between because of the remaining snow, and secondly because I was going to be traveling for the better part of May and June. The first couple of days I decided to be patient and cover as much country as possible with my spotting scope in hopes of turning up a couple of different bears to hunt. After two days of glassing the best areas I know, I was yet to lay eyes on a bear. Even though I love to glass, I love to hike as well, so I decided to try putting my boots on the ground the next few days hoping to find a sign of where bears have been hanging out and glass the same country from a little different angle. After hiking for a better part of the day, I finally found a safe area I could set up and glass until prime time. With an hour left in daylight, I found a beautiful chocolate phase making his way down the canyon on the side hill opposite my position. Then another nice looking cinnamon phase fed out on the ridge above him. Even though it was too late to make a move on either bear, my hopes were brought back to life knowing I was in a right area. Over the next couple weeks, bear sightings were few and far between. Random sign and fleeting glimpses were about all I could put together. No rhyme or reason to anything. My time to concentrate was starting to run short as things seemed to be starting off slower than usual even with the snow lines higher than most years. On the day of May 6th, things began to pick up as I was able to lay eyes on ten different bears, three of those being good sized boars. Watching the bears until dark, my hopes were high as I planned to be back at daylight, a scenario that has worked many times in the past. 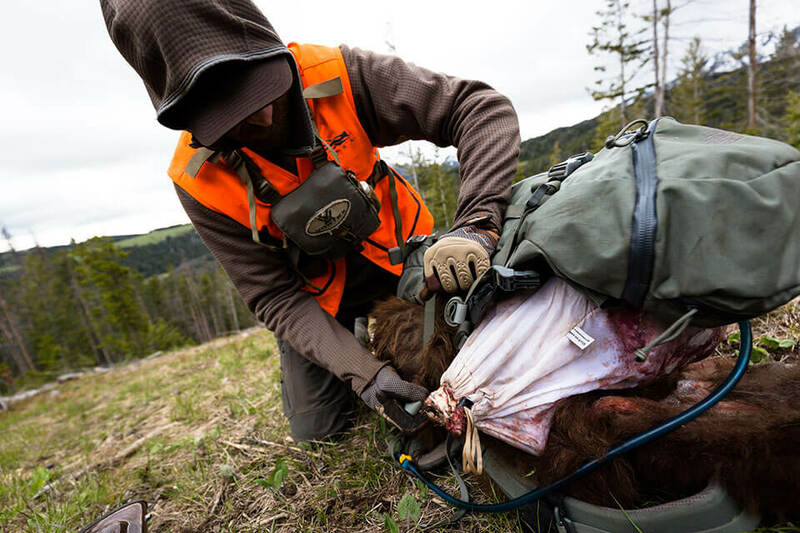 Today was truly a special day of pursuing black bears here in Montana. I spotted more bears than I have ever seen in one day of hunting, which was strange with a gnarly east wind blowing. In the past, some of my worst hunting days have been with an east wind? 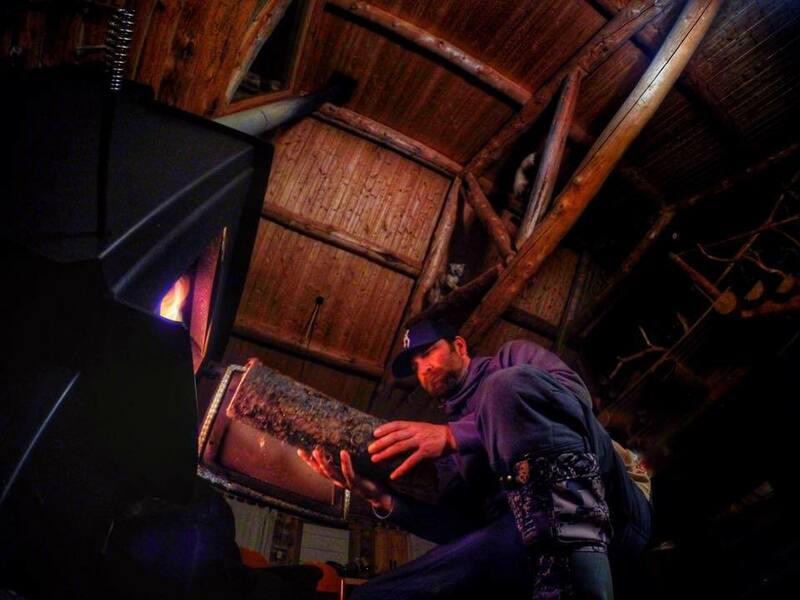 Now it’s time to get a good fire going and turn in for the night with high hopes for the morning. Just as I expected, the next morning I was able to find one of the bears feeding not far from where he was the night before. After collecting my gear, I was off to try and get on him before he slipped into the thick timber for the day. Just as I was getting into the zone, my wind started to swirl as the sun began to build heat. Anyone who’s bear hunted knows that you can fool a bear’s eyes and ears, but you cannot fool their nose. Knowing I was defeated in this attempt, I decided to hike back out and not spread anymore scent across the mountain than I needed to. Plus, this would give me the opportunity to put my glass back on the mountain and possibly find another bear to go after. Once again, I was able to watch nine different bears throughout the day but nothing I felt good about going after due to wind direction, distance, and the amount of daylight left. I felt confident at this point that if I were patient and persistent, I would get my opportunity. The morning of May 8th found me sitting in a familiar spot looking over the same familiar hillsides only today felt different than the past week. The weather was taking a turn for the worst as the clouds began to slowly drop down upon me. Just as I was about to call it quits and go collect my things to head back to town I spotted a bear I chased all last season and never could get close to. It was feeding in a meadow I had pursued it in before so I felt confident I could move in and make it happen before the storm settled in for the day. After putting together a quick plan, I found myself standing only 600 yards from the bear 30 minutes later. I knew from here on in I was going to lose sight of the bear which is something I try to avoid doing but I had no other option. With the wind in my favor, I decided to cover the ground as quickly and quietly as I could, knowing these mountain winds will swirl without warning. Now, within 100 yards of where I last saw the bear, I knew I had to slow down, taking each step with caution. All at once I saw the bear only 67 yards from me laying among the protection of the thick pines totally unaware of my presence. Knowing I could not move in risk of spooking the bear, I took off my pack and was able to set up my cameras just in time for the beautiful cinnamon phase bear to stand up, offering me the perfect broadside shot. Making the most of the moment, I slowly squeezed the trigger, sending my bullet perfectly behind the front shoulder and taking the bear down in only a few seconds. Preparing for the pack out with my MYSTERY RANCH Pintler. Photo by Steven Drake. Taking a moment to give thanks to my surroundings and to the animal that will provide nourishment to my family. Photo by Steven Drake.